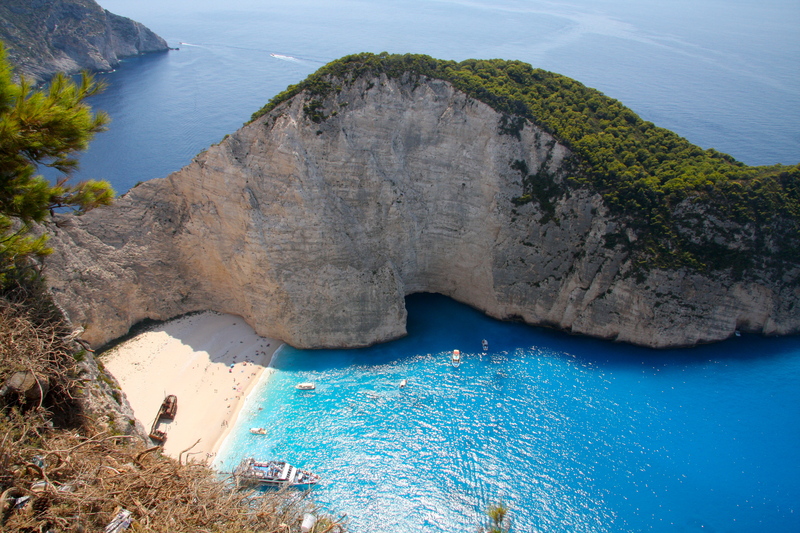 “Having or showing an excessive pride in oneself or one’s achievements.” Such is the Oxford Dictionary definition of ‘smug’; and such is pretty much how I felt after spending two near-perfect weeks this August at Periyali Villas, on the Greek island of Zakynthos. Admittedly, I had high hopes for Periyali. Another one of my babyfriendlyboltholes.com finds, it appeared to tick all the boxes of a great holiday with 2 pre-schoolers in tow. Self-catering villa with 2 bedrooms (no rollaway beds for the children and a lounge to sit in once they’ve gone to bed). Tick. Private pool (no trudging back and forth with towels, inflatables and doorkeys). Tick. Beautiful, undeveloped sandy beach with safe shallow waters for toddler-paddling and turtle nests within 10 minutes’ walk. Tick. Tavernas with high chairs and playgrounds round the corner. Tick. Daily maid service so no emptying bins, scrubbing down work-surfaces or washing beach towels. Tick. 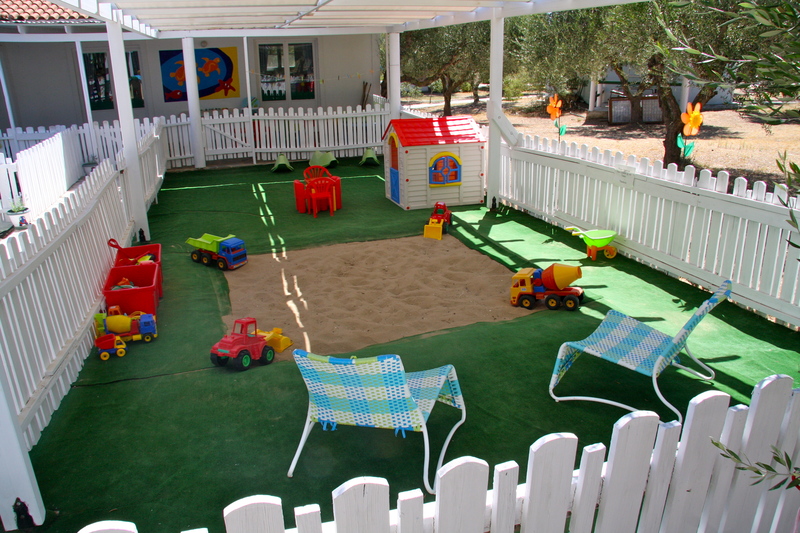 On-site kids club offering a few hours child care so Mum and Dad can have a rest. TICK TICK TICK! Operated by the upmarket UK travel company Simpson Travel, what Periyali offers is really quite unique and I’ve struggled to find anything like it in the Med. Eleven villas are set in nicely landscaped (if somewhat parched) gardens and share access to an on-site creche that is staffed by British nannies. The facilities are excellent – as good as our children’s UK nursery, if not better – with toys, arts materials, books and games and there is a thought-out programme of activities (it’s not just ‘supervised play’). Our son particularly enjoyed the visit by a volunteer from the local Turtle rescue centre, who told him all the things he needed to do to help baby turtles survive their dash to the sea. “We always have to destroy our sandcastles when we’ve finished at the beach, Daddy”. Who knew conservation could be so much fun? The creche will take children from 6 months and splits them into 2 groups – ‘Hatchlings’, for the under 3s, and ‘Turtles’ for the overs; however, in our experience there was no hard division and our son (4) and daughter (22 months) were able to play happily together, which worked well. Simpson will take children up to the age of 10 in the club but I wouldn’t necessarily recommend this. The clientele is generally much younger and I think anyone over the age of 8 will have probably outgrown its (many) charms. And those few hours were just enough. By 1pm, we were ready to pick Leo and Genevieve up and spend the rest of the day together. 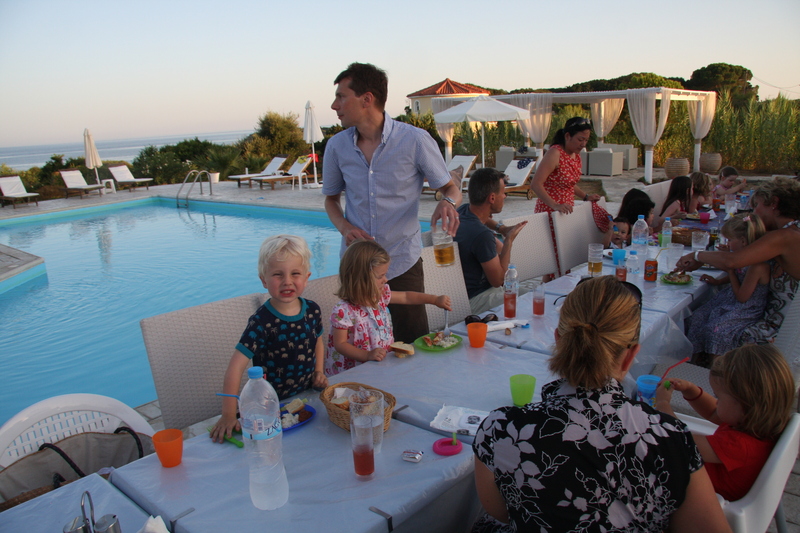 We would fix lunch in our villa and then, after naps and quiet time out of the fierce midday sun, splash in the pool or head down to the beach before heading out to one of the local tavernas for dinner. Eating out was a joy. 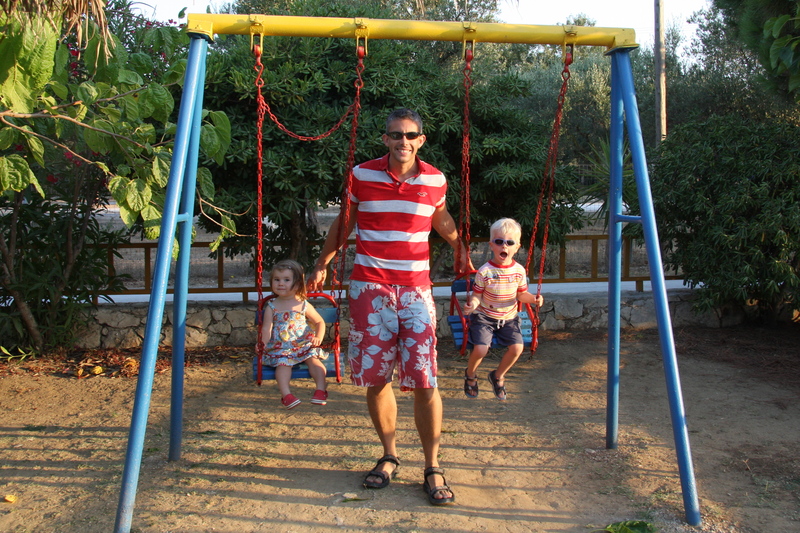 All the tavernas nearby had playgrounds which meant that there was no tedious wait for food – in fact, my wife and I could enjoy a beer or a glass of wine whilst we ordered and the kids played. Our favourite place was called Galini, about 5 minutes drive away, which offered a huge play area with all manner of ride-ons, buckets, balls, swings, slides and… rabbits. It was chaotic and unkempt but the kids absolutely loved it and the food was actually excellent (I can highly recommend the lamb chops and butterbeans). There’s no creche on the weekends, so these are the days to do longer outings round the island. Simpson Travel include a car in the holiday price so it’s easy to get about. 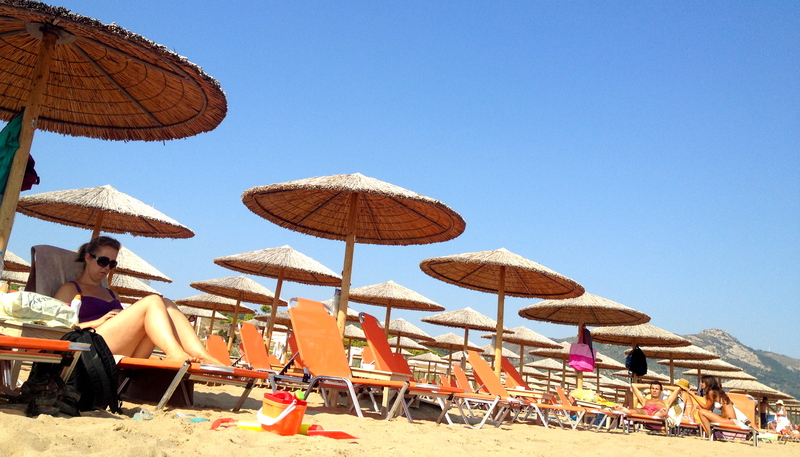 There is a great water park at Tsilivi, about 45 minutes away, that is perfect for little ones (we went twice). We also took in some of the sights and further flung beaches – I’ll be covering off these in my forthcoming destination guide to Zakynthos. However, Periyali’s location on the Vassilikos Peninsula in the far south-east of the island is, in my opinion, the best on the island. Much less developed than some of the other areas, you escape the package-resorts and can just enjoy the excellent sandy beaches and simple eateries, adding to the relaxed feel. It’s worth noting that no babysitting service is offered at Periyali. However, on a Tuesday, the creche holds an evening session instead of a daytime one. The staff put a film on for the children allowing Mum and Dad to have a night out. It’s very exciting for the kids (Leo thought we were the unfortunate ones not being ‘allowed’ to go) and very sweet – little beds are laid out, you deliver your children already in their pyjamas and pick them up – mostly passed out on their mattress – at 10.30pm. The set-up at Periyali means you can be as private or as sociable as you like. As well as your private pool, there is a much larger communal pool surrounded by sunbathing terraces. People tended to congregate here in the evenings, when it was a bit cooler and the kids could be outside safely. It was a good opportunity for the kids to meet up again and splash about whilst the parents chatted over beer from the poolside bar – which also served snacks and lunches should you want them and, most importantly for Leo, ice creams. Once a week there is a BBQ with entertainment which was also fun. 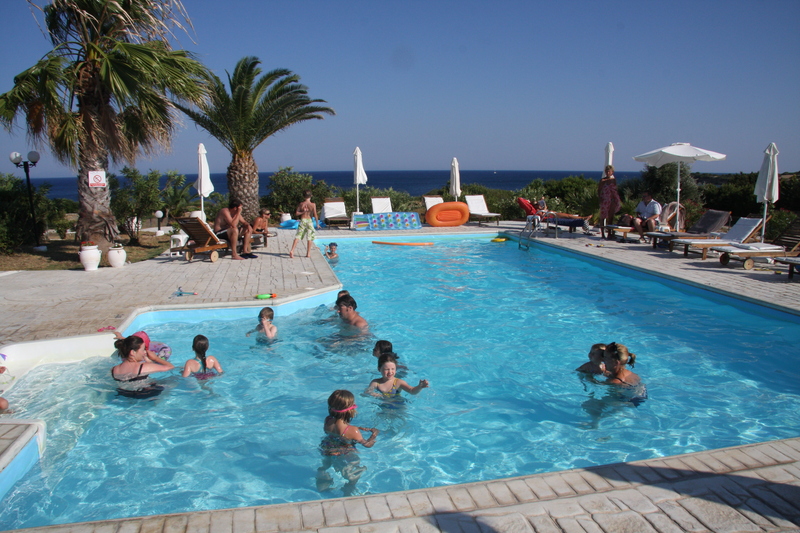 A nice touch was that the kids club staff would look after the children for an hour or so allowing the parents to have a drink and a chat uninterrupted by kids running frantically around the pool or demanding the aforementioned ice creams. So what were the downsides? For us, there really weren’t that many. Some may feel that, for the considerable cost, the villas are not luxurious enough. Whilst they offered everything I would have expected – well-stocked kitchens, efficient air-conditioning (absolutely essential in the middle of August) comfortable beds, they are not ‘5 star’ and some of the fittings, particularly the bathrooms, could do with a refresh. However, this did not bother me or my wife (and certainly not the kids!) as the rest of holiday elements were so right. Another consideration is the heat. We were worried about how the children (and ourselves) might cope in the fierce August temperatures – which frequently hit 40 degrees. In the end, with a bit of adjustment, it simply wasn’t a problem. The children would be in the air-conditioned creche in the morning and we’d all stay in the villa over lunch, emerging in the late afternoon when the sun was less fierce. What it did mean was the water was warm – in the pool and the sea – and for once we didn’t have to worry about freezing getting in and getting out (the bane of ‘shoulder season’ travel). If all this has whetted your appetite, a word of warning: one week at Periyali is not enough. This is a place you settle into and it’s addictive. After week two we could have happily had another – we had got used to the rhythm of a few hours to ourselves, pool, beach, dinner and bed. We had such a good time that a return visit is definitely on the cards – and that’s rare for us as we are constantly seeking somewhere new. Now our son is starting school and we are restricted to peak weeks, we can’t spend too long deciding. We were told over 60% of Periyali guests are repeat visitors who book early – sometimes over a year in advance. If you want to get smug, get organised! 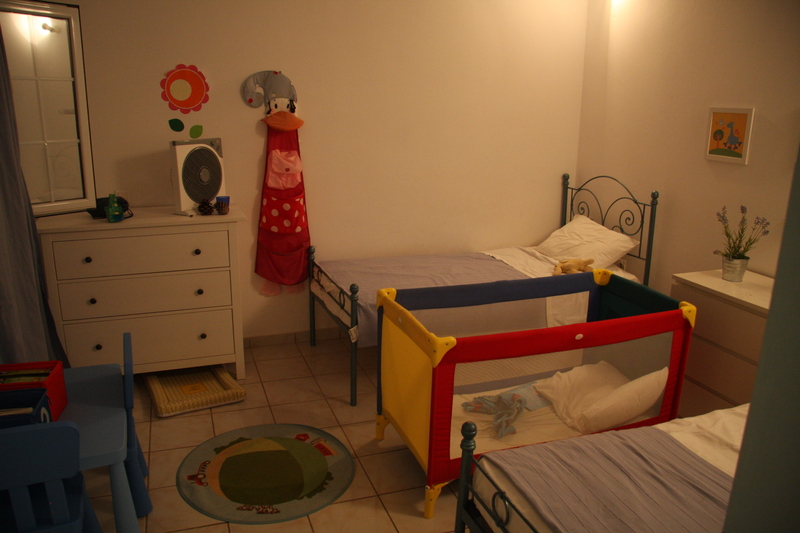 This entry was posted in Accommodation reviews, Europe and tagged Kids Club, Periyali Villas, Simpson Travel, Zakynthos family holidays, Zakynthos villa rentals. Bookmark the permalink.